Ellie has been flashing her irresistible toothless grin for weeks now. Often she seems right on the verge of a good belly laugh, but doesn’t quite let it loose. We’ve (ok, mostly I’ve) been putting on our funniest faces and acting out our most ridiculous antics to no avail. The most I get for hopping around on one foot with my tongue lolling out and blowing raspberries is a crooked little grin. Alas. Until tonight!! We’ve mentioned before that Ellie really enjoys bath time. She still (barely) fits in the bathroom sink so she usually gets a quick scrub down while she enjoys splashing about and eating bubbles in her small sudsy pool. Tonight I thought she might enjoy a more extended time in the big bath. Boy, was I right! She was lounging in her bath seat and having a grand time paddling her feet when I started squirting her with one of her bath toys. Click on the picture to see the result. When the advertiser from the local convenience store dropped through our mail slot this week we were immediately drawn to the “American Classic” displayed on the front page. It’s always nice to have a little taste of home, right? Well…you be the judge. Next time I am in Alabama, I’ll definitely have to stop off for one of these. Or I can enjoy it now for the bargain price of 4 for a pound! 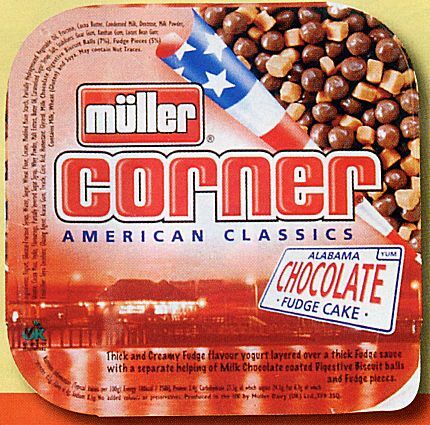 Just in case you can’t make out the description at the bottom of the label it says, “Thick and Creamy Fudge flavour yogurt layered over a think Fudge sauce with a separate helping of Milk Chocolate coated Digestive Biscuit balls and Fudge pieces.” MMMmmm…. There’s nothing like the promise of digestive biscuit balls to get me longing for home. To be fair, there are some American snack foods peddled under the banner "English" that I know would make any common Englander cringe. Here's a good example. We've mentioned before that one of the great things about living in England is the cheese. The variety and flavor are fantastic (and we hear it pales in comparison to what can be found on the mainland!). 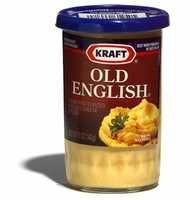 So to have "English" and "Pasteurized Process Cheese" appearing on the same label must be quite an insult. 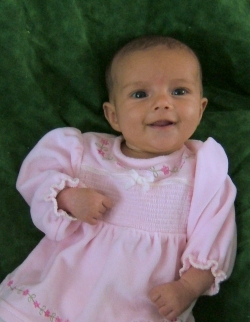 Ellie has been an easy and friendly baby all along, but for the past couple of weeks her smiles have made her even more arresting. She smiles at Mummy. She smiles at Daddy. She smiles at friends, old and new alike. Once she locks eyes with you, a smile creeps over her face that is unstoppably contagious. I sometimes have an image of her smile appear in my mind as I am falling asleep and wake myself up with my giggles. Oh smitten heart! The military has a highly evolved technique of taking raw recruits and turning them into soldiers in short order, through what is normally called boot camp. A drill sergeant once explained to me that the purpose of all the screaming, insults, sleep deprivation and incessant and irrational demands is first and foremost to break down the recruit's sense of self and identity. After several weeks, when that individuality and identity is fragile, the drill sergeant's job is then to mete out small rewards and affirmation, reconstructing the recruit's sense of self around the camaraderie of the unit and the new identity of "soldier." "Screaming, sleep deprivation, incessant and irrational demands...," any of that sound familiar? God's little drill sergeant. Think about how desperately you look for those first smiles. Cults use these techniques as well. I'm not sure I'd liken Ellie too much to a drill sergeant, but she somehow knows how to get her way — sometimes with a cry, sometimes with a quivering chin, and usually with a smile.